Drought affects everything: food supply, livestock, nutrition, business opportunities and futures. Ethiopia is in the midst of its worst drought in 50 years. Families have been struggling to buy food, cover household expenses and pay for schooling. REAAP, the Resilience through Enhanced Adaptation, Action-learning and Partnership Activity, works to strengthen communities in six districts where food is scarce. The goal of the 3-year program led by Catholic Relief Services and funded by the U.S. Agency for International Development is to reduce a community’s long-term vulnerability to climate change and climate-related shocks and stresses. One of the ways to do this is through Savings and Internal Lending Communities (SILC). SILC groups help thousands of women and their families improve their economic situations by starting small businesses, buying livestock or even sending their children to school. Momina Gezali, 38, has no formal education and can’t read or write. She lives with 8 of her children and her husband in the East Hararghe Zone of Ethiopia. She joined a SILC group 15 months ago after struggling to provide for her family. Through SILC, Momina could purchase two goats and a pregnant sheep. In a year’s time, Momina increased her total to six goats and two sheep. Momina intends to sell one of the animals and invest in feed for the others since she knows it can be hard to feed animals during the long dry season. Her hope is to sell offspring of the goats and sheep and acquire a heifer. Momina says she is determined to keep saving and participating in income generating activities. Genete Mehammed, 35, has a very similar story. Currently, she owns four goats, two sheep, a heifer and two donkeys. She acquired these after she joined a SILC group. Genete recently sold a goat to cover the wedding ceremony of a relative, and gave another one to her sister. “My sister gave me a goat when I constructed a new house. 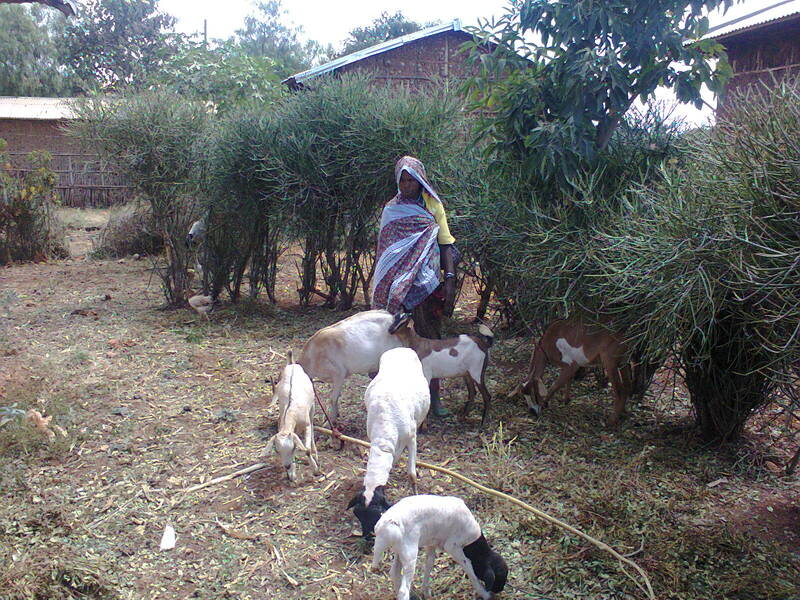 As she constructed a new house very recently, I should have given her one of my own goats as a sign of mutual support and repaying her in kind,” she says. Genete would like to continue saving with her SILC group members. She says SILC is helping her family fight poverty and be good examples for the rest of the community. Momina and Genete are not alone in their SILC success. Other SILC members have bought hens for eggs and income generation. Others have noticed a development of strong savings habits that have made a difference in their lives. Fatuma Ali, 45, is one of those women. The mother of 10 joined SILC 2 years ago. Over that time, she has taken out two loans to buy livestock and a donkey for transporting water and other goods. 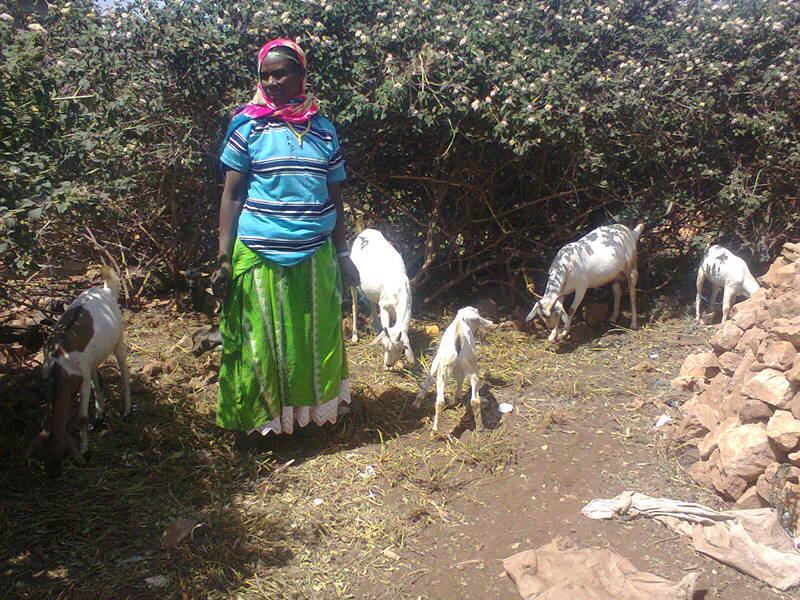 Prior to joining the SILC group, Fatuma had a goat. Currently, she owns six goats, a heifer and a donkey. Fatuma also gains power from what she learns at the SILC group, and looks to make more investments for her family.